This little scene speaks for itself, I believe! Bunny's friends know him well and have given him books for his birthday, mostly non-fiction and how-to manuals. He's going to have learn how to build himself another bookshelf! 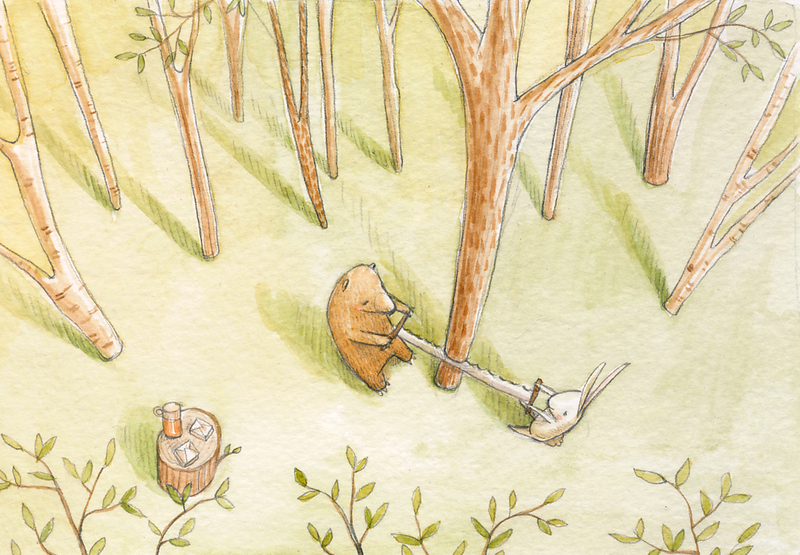 Here are a few more of the most recent Bunny and Bear pictures. 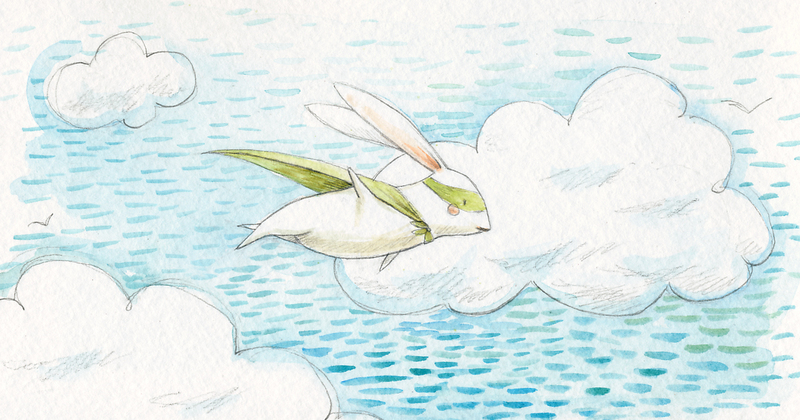 I'm working on illustrating the characters in diverse settings and using interesting perspectives. 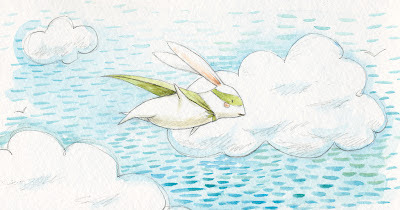 I really love the painting of Super Bunny (above) because he seems weightless, like the clouds behind him. This one shows the interior of Bunny's home, in the trunk of a tree. 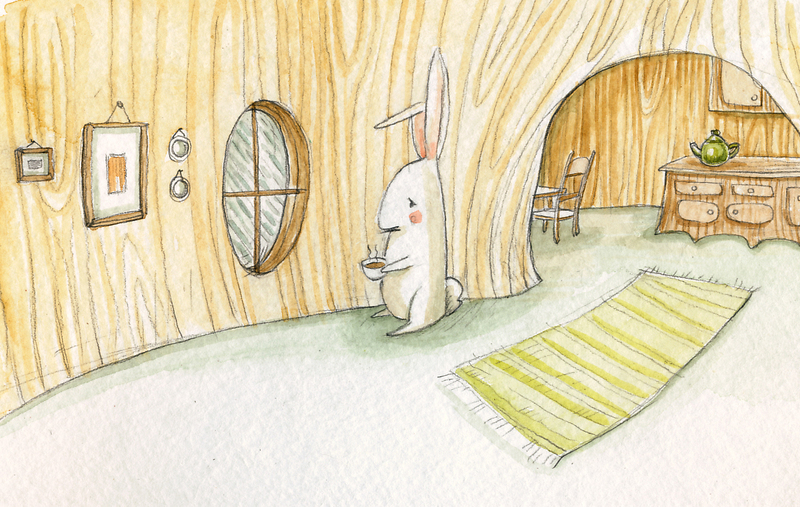 His place is cosy and he has made pot of hot chocolate to cheer himself up a bit because his plans for the day must wait until the rain lets up. 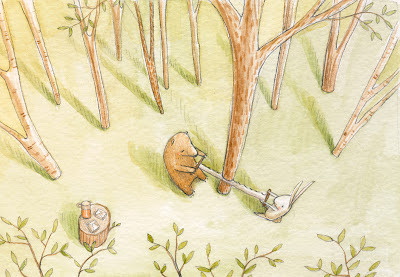 Bunny has recruited Bear into helping him build a boat, so they pack a lunch of sandwiches and a thermos of cocoa and begin felling the first tree to make into lumber. 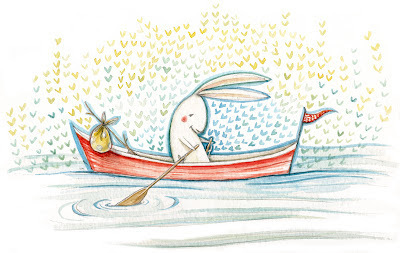 I don't think they realize how much work building a boat will be, but at least they are doing it together and have brought snacks to carry them through it. Sometimes you happen to create a character or two who really interest you. These little friends are Bunny and Bear and they are the main characters in a series I've been working on. 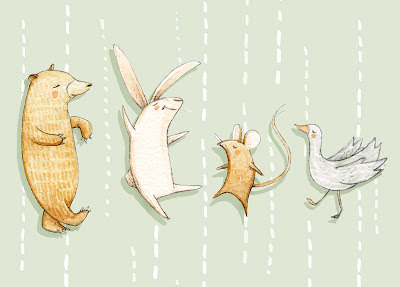 For some reason I have grown fond of them, like friends, and am having a great time thinking up a world for them to live in. 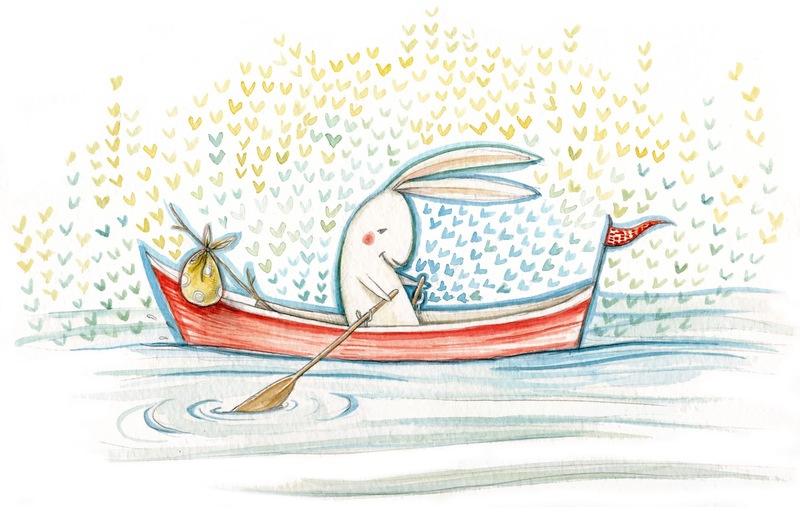 Bunny is curious and is always scheming and trying new things, like building a boat or organizing a pancake feast for the neighborhood. He doesn't mind taking a day off though, to just laze about and nap in a hammock! 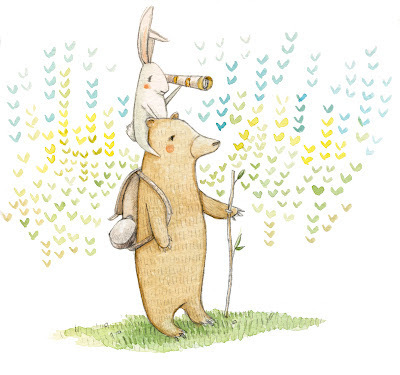 Bear is Bunny's best friend and the friend we all hope to have, dedicated and thoughtful, although he's got some quirks which make him unique and even more lovable. 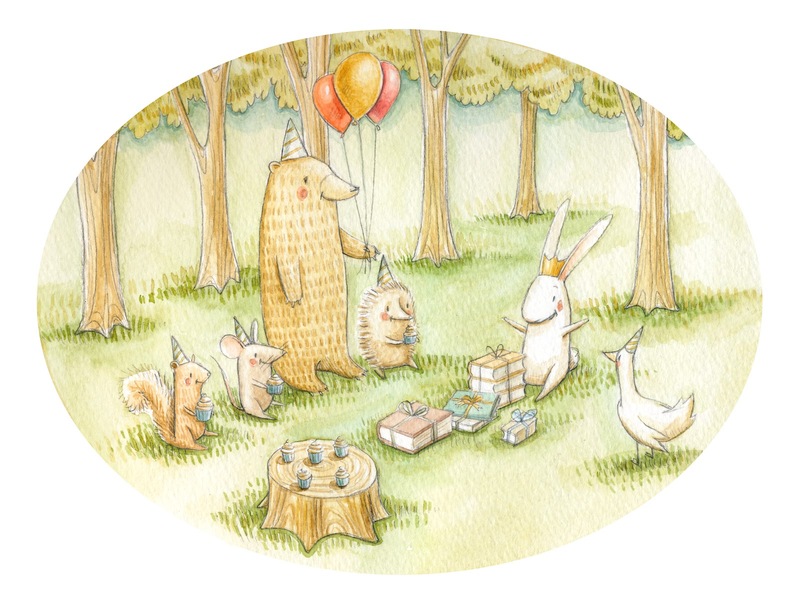 Stay tuned as I will be posting more of the adventures of Bunny and Bear! 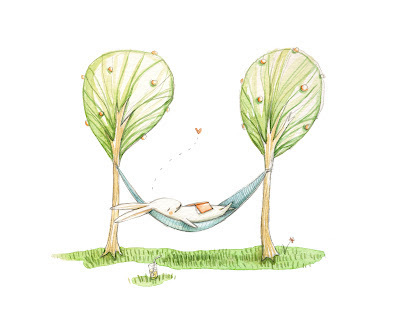 I also want to mention that I attended the Summer conference of the Society of Children's Book Writers and Illustrators last weekend and it was amazing. I learned so much and was incredibly inspired by the wonderful speakers. On top of that my portfolio received and 'Honorable Mention" at the portfolio showcase! If you are looking to become an illustrator or author of children's books, I highly suggest joining this society because it's a great resource and community.